In response to the police raid of the Lakeview Sit-in yesterday and in order to continue the struggle for these 5 schools and for quality, fully-funded public education we rallied at 5pm outside of Lakeview Elementary School. After the rally we marched to Tony Smith’s house and arrived to his house chanting “Tony Smith: Re-Open or Resign”. 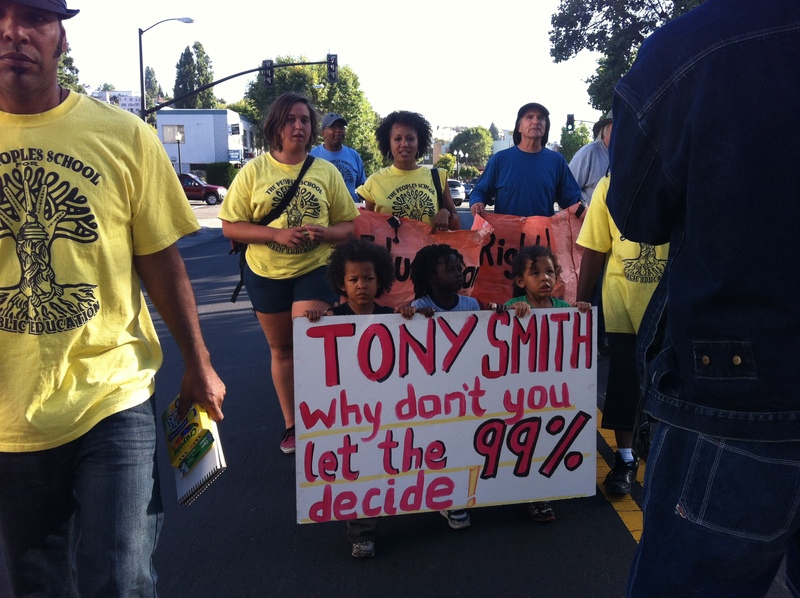 We had various speakers in front of his house demanding that Tony Smith listen to the people, Re-Open our Schools and stop his destructive cuts and privatization of Oakland schools. driving out hundreds of experienced teachers and ripping up union contract protections. eliminating $2.1 million of transportation funds for Special Education. draining the public schools of students and money by increasing the proliferation of charter schools, that drain public schools of students. The rally and march of 250 children, parents, teachers and community members showed the power we have moving forward from the Lakeview Sit-in in the struggle for public education! !